“India has won! 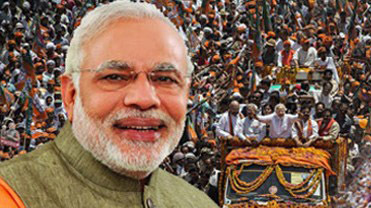 good days are ahead,” BJP’s Prime Ministerial candidate Narendra Modi said on Friday in his first reaction to the poll trends that indicate an impending BJP victory in the Lok Sabha polls. “India has won! Bharat ki Vijay. Ache din ane wale hai (good days are ahead),” Modi, who is all set to become the Prime Minister, tweeted. Modi later met his mother to seek her blessings. “I look forward to receiving your good wishes on the specially created Victory Wall,” he said, while sharing a wall where people have started giving their comments congratulating him for the phenomenal victory his party achieved under his charge. Top BJP leaders including L K Advani and Rajnath Singh congratulated Modi for the party’s electoral victory. Buoyed by the party’s stellar performance, celebrations started at BJP’s Delhi headquarters right from the time initial trends started trickling in and workers and leaders danced to the beats of drums and distributed sweets. Modi has won the Vadodara seat with a huge margin.